You can now do more that your usual internet surfing habits as Smart added unli-text to all networks on their GIGA50 promo. From the previous bundles which includes 1GB of data plus 300MB access of app of your choice now comes bigger as they load up additional unlimited all-net texts. Still the same price and validity period but with more network services bundled. This offer is almost all-in, you can surf to your favorite websites, social networking sites like Facebook, Twitter, Instagram and even watch videos on popular streaming apps. You can subscribe to this promo via SMS, just have to reload your prepaid SIM card with a regular load amount of 50pesos. It can also be loaded directly to your mobile number, just ask your load seller if it’s already available on their Smart Menu retailer SIM so you don’t need to register it on your own. For your reference, we’ve provided the keyword format for those who want to enroll GIGASURF 50. 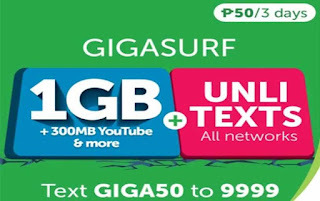 Update: Smart prepaid subscribers who register to Smart GigaSurf promos from November 1 to March 31, 2019 will now enjoy free 1GB/day data everydata for YouTube, iWantTV, iFlix, iWantTV, NBA League Pass, and Cignal TV video streaming. Other denominations Giga299 or Gigasurf 299 internet surfing promo. Wait for the SMS notification after you register and before you start using this promo to avoid regular load deduction. Remember to use your data wisely while using any GIGASURF promo offers as they only give you limited MB’s and GB’s. This is also compatible with Pocket Wi-Fi, USB broadband and even on LTE SIM cards. How to dial to claim the unli calls? Is there a combination of code you put before the actual 11 digit phone number?